This is the ideal way to transport and store Outcast and Fish Cat float tubes. 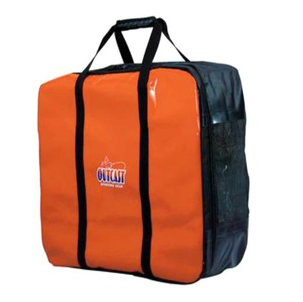 The bags top load design makes loading and unloading a breeze. This bag is spacious enough to accommodate a float tube, fins and a pump. This bag will fit any size of float tube as well as your fins, boots, net and Waders. Length x Width x Height: 29.5" x 24" x 11"
Our top-selling wader bags incorporate the signature two storage areas for wet and dry gear. Mesh drain holes allow air to circulate around wet gear and the changing mat is now removable. The dry storage area can be accessed with the bag open or closed. A rubber carrying handle and non-slip shoulder strap are incorporated into this value-priced bag. Easy step-in fin designed for wading boats. One cinch strap makes fin kicking a breeze. Made from tough molded plastic. Length x Width x Height: 20-1/2" x 9" x 4"